When you go out in the dark to fish in the surf, it is important that you be cautious. It’s generally a good idea to bring along a partner but if you are more of a solo fisherman than you’ll want to create a detailed plan and leave it with a friend or family member just in case. Your fishing plan should have what time you plan on arriving at the beach, the exact location you plan on fishing, you’re cellphone number, and the time you plan on finishing up your fishing for the night. If plans change while you are out, you’ll want to reach out to whomever you left your plan with in order to update them. As a part of the planning process, doing some scouting ahead of time, during the day is a great idea. During the night, you won’t be able to rely on congregating bait, busting fish, or circling birds in order to guess where the fish are. 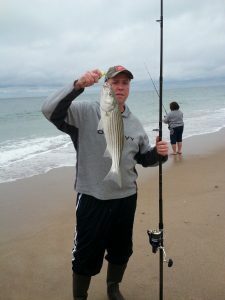 Identifying the feeding patterns of stripers in relation to the wind, tide, and individual bait movement will be helpful. There tends to be a rhythm to feeding patterns of fish at night and it’ll pay dividends to figure them out. Once you’ve found a good spot, mark it on your map and then head out during the night to see how you fare. After detailing your fishing plans, you’ll want to make sure you bring along some necessities: A cell phone is obviously a great idea but makes sure to wrap it in a plastic bag for some protection. A first aid kit or at least a roll of medical tape should be brought along in case of an accident. Having a compass is also a great idea in order to get your barrings. After a night out in the surf, heading back in the dark can be a bit disorienting and you may find it difficult to know which way is which without one! Ensuring that you are adequately prepared before setting out will make the chances of a more fruitful and enjoyable fishing trip much more likely. Consider fishing in a location you are familiar with the first few times or at least scout out your planned location during the day time to get a feel of the area. It should go without saying but being sure that you’ve brought along a decent light will make your trip out in the surf at night much more enjoyable. A secret of night fishing, in general, is to wear a good headlamp so you can light up wherever you are looking while keeping your hands free. Having your hands free will enable you to deal with your baits, unhook any fish you might catch, and deal with whatever else you might need to do. In order to preserve your night vision, another secret is to use a red light so that you can still see everything. If you find you’re getting a headlamp headache, consider wearing the headlamp around your neck for a while and move it up to your forehead only when you need it most. A red light is key here in order to be able to see better in the dark but you’ll still want to bring along a brighter, normal flashlight for better visibility when it comes time to unhook any fish or for the return trip at the end of your trip. Although it may be tempting to go out into the big surf, it’s best avoided at night. Large swells can come in fast, without you noticing, and you don’t want to get knocked over! If you do have to wade, make sure you’re wading a wading belt that you can cinch over your waders. A wet suit is also a good idea, as an alternative to waders, due to it’s increased buoyancy which will help if you happen to get knocked into the surf. It may seem counter-intuitive, but a real secret of fishing at night, and surf fishing, in general, is that fish are much more likely to strike close to shore. Fishing the plug all the way up, and being sure to be prepared for a strike right as you’re pulling your line in may result in some surprising results! Another secret of surf fishing at night is to bring along more than one surf rod During the night, you never really know what’s out there. By having a few different surf rods set up with different rigging will enable you to fish using multiple baits and will also help if you decide you need to fish for more bait. The preferred set up would be a spinning reel with bait runners as this setup will allow you to relax a bit without having to worry about that monster fish taking your whole setup out to sea. A dual drag setup is also a great means to keep your rod in your possession. The techniques required for a successful surf fishing trip out at night are generally the same as you’d employ during the day. By employing some of the tips and secrets outlined above, you can be sure your trip out in the surf is a successful one. Surf fishing at night is a great way to relax while increasing your chances of catching large fish more frequently!